Beth El Cares focuses on chesed and tzedakah by helping the poor and unfortunate through mitzvot, both in our synagogue and the greater Stamford community. We welcome volunteers! This is the work we are currently engaged in. If you are interested in volunteering in any of these endeavors, please contact the person listed. Reyut (Friendship): Committed to serving the needs of those in our TBE community, including friendly visits, assistance with errands and transportation, Shabbat bag delivery to hospitalized patients. Contact Melanie Massell at reyut@tbe.org or (203) 324-7190. Project Ezra: Providing pre-shiva meals to the bereaved in the congregation. Contact Joy Katz at joyakatz@yahoo.com or (203) 329-3359. Serving the homeless: Helping prepare and serve food — you can do either or both — to the homeless at New Convenant Center in Stamford on the fifth Thursday of each month. Times are 2:30-4:15 pm and 4:15-5:30 pm. Contact Amy Temple at kbtemple@optonline.net or (203) 496-1309. High Holiday and Passover food drives: Contact Ken Temple at kbtemple@optonline.net or (203) 962-1491. 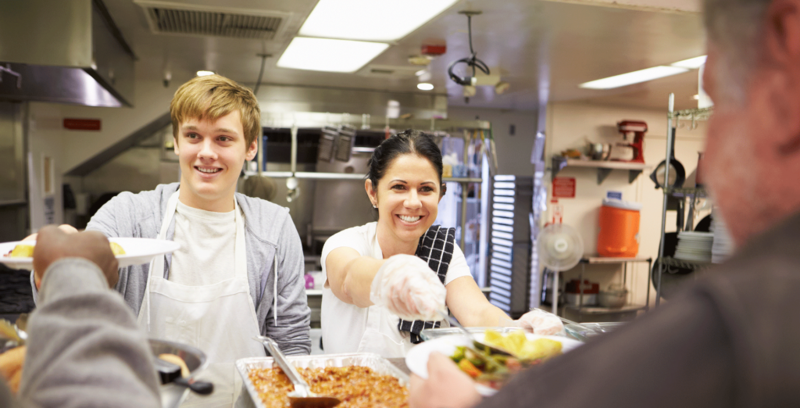 Christmas dinners at local homeless shelters: Contact Amy Temple at kbtemple@optonline.net or (203) 496-1309. If you have your own idea for a Beth El Cares project, please contact Ken Temple at kbtemple@optonline.net or call (203) 962-1491.